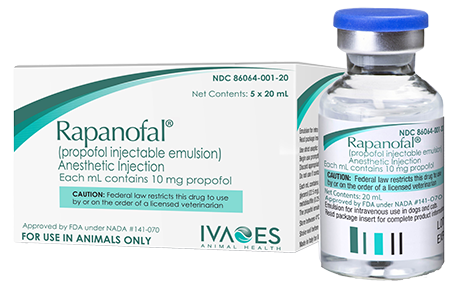 Rapanofal®(propofol) is an anesthetic injection for use in dogs and cats. When using Rapanofal® injection, patients should be continuously monitored and facilities for the maintenance of a patent airway, artificial ventilation, and oxygen supplementation must be immediately available. The clinical use of propofol without available supplemental oxygen and artificial ventilation has not been adequately evaluated and is not recommended. Copyright © IVAOES, LLC 2019 All rights reserved.